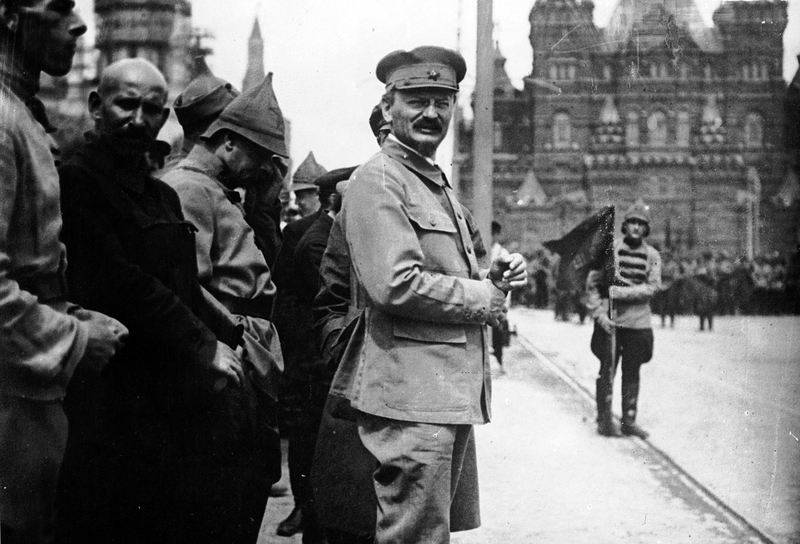 1918: Leon Trotsky attends a parade in Red Square, Moscow, as Lenin reviews his troops. The Bolsheviks came to power in Russia on Nov. 7. Coincidentally, this day was also the birthday of Leon Trotsky, one of the leading 20th century Marxist philosophers and a close ally of Vladimir Lenin. Trotsky was one of the leading candidates to succeed Lenin as the leader of the Bolsheviks, but lost out to Stalin’s faction in an intra-party struggle. His ideas still influence the leftist movement worldwide. Here are six facts about the early Soviet politician. Leon Trotsky was born Lev Bronstein in 1879 in the village of Yanovka in the southern part of what is today Ukraine. His parents were Jewish landowners who lived a quiet life in the village, but young Lev embraced revolutionary ideas from an early age. When he was just 17, he joined an underground organization and was imprisoned two years later. He spent two years moving between prisons in Nikolayev, Kherson, Odessa and Moscow before being sentenced to four years of exile in Siberia in 1900. In 1902, Bronstein fled to Europe from Siberia on a forged passport bearing the name Trotsky. He participated in Marxist groups in Europe and returned to Russia to take part in the 1905 revolution. He was imprisoned again, fled to Europe, worked as a war reporter in the Balkans, and during World War I, he left for the United States. He was living in New York when Nicholas II abdicated in February 1917. He decided it was time to return to Russia. Trotsky met Vladimir Lenin in London in 1902, and Lenin had a great influence on him. The two men fought dramatically from time to time. In 1902-1903, Trotsky supported the moderate Mensheviks while Lenin led the more radical Bolsheviks. For this, Lenin called Trotsky "Judas," — a reference that would later be recalled by Stalin in his fight against Trotsky. Eventually the two men reconciled and Trotsky supported Lenin in the 1917 Revolution. Lenin and Trotsky also disagreed on how to negotiate the peace with the Germans to pull Russia out of World War I, how to handle agriculture during the war years and how to deal with trade unions. Nevertheless, the men mostly managed to work together for the good of the revolution. When the Russian Civil War broke out between the Bolsheviks and the pro-monarchist “white” forces in 1918, Trotsky effectively created the Red Army from scratch. He traveled extensively around Russia on a train, forming and managing military units. According to his own estimates, the train traveled more than 65,000 miles during the war. Trotsky's greatest strength was his skill as a speaker. In his biography of Trotsky, “The Prophet Armed,” Isaac Deutscher comparing him to biblical figures in his ability to command and inspire. The authors of The Harper Encyclopedia of Military History attributed the Bolshevik’s victory in the Civil War to Trotsky's administrative and strategic talent. "Trotsky was an intellectual in the truest sense of the word," wrote artist Yury Annenkov. He recalled that Trotsky, in contrast to many other Bolshevik leaders, was educated, polite and happy to talk about art. Trotsky's intelligence did not make him a gentler person, however. Like other Bolsheviks, he supported the concept of the "Red Terror" — the destruction of all the enemies of the revolution. "Ruthlessness," Trotsky said, "is the highest revolutionary humanism." Once he personally ordered the execution of every 10th man in a regiment that had fled from a battle. In the years of revolution and civil war, Trotsky was the second man in the Bolshevik Party after Lenin. But after Lenin fell ill and died in 1924, his influence began to wane. In his book "Building Lenin's Russia," Trotsky's contemporary Simon Lieberman notes that Trotsky, a brilliant theorist and speaker, didn’t have many social skills. "His closest aides admired him, to be sure; but even at that, he was always a lonely figure [in the party]," Lieberman wrote. Joseph Stalin, who held a more modest position in the party in the first years after the revolution, seized the initiative and was able to convince other party members to join his side. Trotsky contemptuously called Stalin "the most outstanding mediocrity of our party," but this "mediocrity" managed to quietly win over the majority of rank-and-file Bolsheviks, which brought him the victory in intra-party disputes. In the late 1920s, Trotsky lost position after position in the party. He was accused of "petty-bourgeois deviation," and his supporters were pushed from power. In 1929, he was deported from the Soviet Union. Stalinist propaganda transformed him into a nefarious figure intent on bringing down the revolution. He lived first in Turkey, then in France and then in Norway before being denied asylum and deported to Mexico in 1936. Throughout the years of exile, Trotsky harshly criticized Stalin for betraying Marxism. In his words, "the leaden rump of the bureaucracy outweighed the head of the revolution." In 1939, Stalin ordered his elimination, and a year later, Trotsky, then 60, was fatally stabbed with an ice pick by Soviet agent Ramon Mercader at his home in Coyoacan, Mexico. Trotsky was buried on the property. A modest obelisk with a hammer and sickle adorns the grave of the once-powerful leader of the revolution.